Okay, sometimes dental news is just too cool not to share. 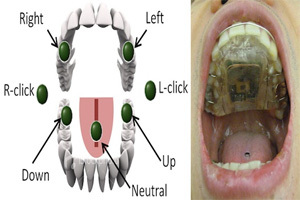 Scientists at Georgia Tech recently developed the Tongue Drive System, a wireless device which allows users to wear a less conspicuous dental retainer embedded with sensors, thus enabling people with high-level spinal cord injuries to operate a computer and maneuver an electrically powered wheelchair on their own. How it works: a magnetic stud in the tongue acts like a mouse against a pad attached to the roof of the mouth. The sensors then track the location of the tiny stud. Outgoing signals are wirelessly transmitted via the sensors to an iPod or iPhone, and special software allows the device to control the movements of a cursor on a computer screen or to work as a substitute for a joystick in a powered wheelchair.